You don't wear the same clothes all year round so why use the same skin care products? "Your skin has different needs and reacts differently depending on the time of year and weather conditions," explains Dr. David E. Bank, Founder and Director of the Center for Dermatology, Cosmetic & Laser Surgery and author of Beautiful Skin; Every Woman's Guide to Looking her Best at Any Age. This winter, avoid dry, dull or lackluster hair and let your locks shine with PureOlogy! PureOlogy GlossingMist ($25 SRP) is a breakthrough shine spray formula of lightweight silicones to indulge hair with a renewed luster and shine, while repairing, protecting and enhancing vibrancy of colour-treated hair. Unlike most shine sprays, which merely coat hair to create the illusion of a healthy sheen, GlossingMist penetrates the hair to strengthen, repair and create an inner luster. When celebrity make-up artist Belinda Moss worked the New York 2007 fall fashion show along with many of her contemporaries, she was finishing off the season's fashion look with bold and beautiful looking lips. Moss, in her informal Softlips(r) lip trend forecast, predicts that women across America will be donning red and bronze smackers for the winter season. This strong lip style can work with all skin types with just a little bit of precision and patience, she reports. Marilyn said it best – "Diamonds Are A Girl's Best Friend." 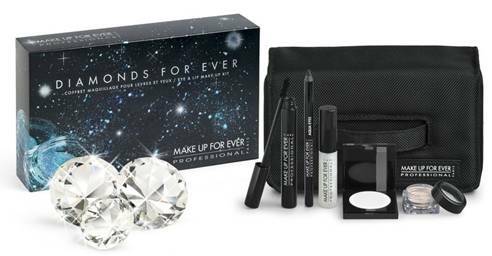 Spoil your best friend (or yourself) this holiday season with the limited edition Diamonds For Ever gift set, a sparkling Eye & Lip Make-up Kit from the professionals at Make Up For Ever. What it is: A water-based solution that transforms any powder eye shadow into creamy liquid shadow.What is does:This clear liquid extracts the pigmented particles of powder eye shadow and bonds with them, with just a few drops. Easy to use, this unique cream formula that's created results in the ultimate payoff: rich, vibrant, intense color that lasts. If you've been told you have great lips, don't 'kiss off' the compliment. Instead, put your lips to work and enter the second annual Softlips "Picture Perfect Lips" search, now open to women ages 13 and older. The winner will receive a cash prize of $2,500, a chance to become a parts model and the prestige of having the perfect pucker, which will be posted online at www.softlips.com. With today's hectic lifestyles, women are always on the go, making makeup maintenance throughout the day difficult. However, according to celebrity makeup artist Belinda Moss, you can make your 9 a.m face last until the evening commute with a few key on-the-go touch-up tools and techniques. "There are a few key items you can throw in your purse to improve your look in just a few minutes, even when you're in a hurry or on the road," says celebrity makeup artist Belinda Moss. What a pleasure to sit down for a virtual chat with Dr. Susan Taylor, Creator of Rx for Brown Skin, to discuss the beauty challenges facing women of color. [ Valery ] First of all, what are the specific challenges that face ethnic skin? [ Dr. Susan Taylor ] The major challenge is hyperpigmentation (dark marks) that develop after the skin is inflamed or injured. So a pimple, curling iron burn, or a scratch can leave a dark mark that can last for weeks if not months. Uneven skin tone and dull skin tone are also important challenges.